composers: Sergio Assad, Jorge Cardoso, Ariel Ramirez. 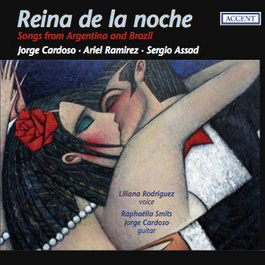 - the title song "Reina de la Noche" of Jorge Cardoso is performed in trio by Liliana, Raphaella and Jorge (about the heartbeat of the dazzling nightlife). "The combination voice plus two guitars should be used more often. The guitar duo Smits-Cardoso is perfectly adjusted. Tone and timing are completely in balance. For the singer Liliane Rodriguez it must have been a pleasure to work with such excellent musicians. The songs have been written just right for the Argentine singer. With her splendid voice, the necessary temperament and an inborn instinct for style, she puts down a matchless interpretation of this South American repertoire. Rodriguez sings 'con sentimento popular', but splendidly dosed and at the correct places. Raphaella Smits’s playing carries the CD, because she accounts for the five solo works and she has an important share in all remaining works. Raphaella may be called quite rightly the ambassador of a particular tone culture. This could easily become the favourite CD of many guitar lovers. An absolute must!" "For this anthology the artists have choosen consciously for diversity in unity. The texts covers a direct popular idiom, as well as verses of topclass literature. The music, with its genuine South American heartbeat, ranges from dance character up to impressionistic composing. A highly authentic and valuable performance: passionate, melodious and poetic. Very successful! ".